﻿﻿﻿It's 2011. Can hardly believe it. Talk about time flying! Happy New Year to you all - I hope this year is the best one yet for all of us! Our Christmas was jam packed with lots of fun things. Having visitors made it extra special - lots of shopping & sight seeing, trip to Dubai, desert adventures, camel races, lots of great meals cooked up in the kitchen, some fine dining out, and many many laughs... really good times. ﻿ For as long as I can remember, I have avoided all rides at any type of amusment park or travelling fair. I am really not cool with anything that spins me around, tips me upside down, shakes me from side to side, or projects me out into the world at speeds that only a gun shot should travel. I like to be the onlooker, as Colin will attest to. Take a few pictures or munch on a tasty treat. If I am in a really good mood, you may be able to persuade me to get on a merry-go-round, or, if I am feeling a little wild and crazy, possibly a smallish ferris wheel. That's it though - no Pirate Ship, Gravitron, Zipper, Spinning Tea Cups, Space Mountain for me... you get the idea. This girl likes her feet firmly planted on the ground, thank you very much. So, dune bashing. In honor of Laura and Stan's visit, I arranged a babysitter for Ella and prebooked a trip to the desert with a local tour company. 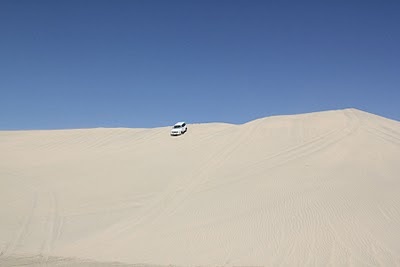 Our driver was Qatari, and picked us up near our house to drive us out to the Qatar desert for a day of fun. He stopped along the way a few times so we could take pictures and ride camels (Colin & I happily acted as photographers as our guests saddled up). At our last stop just outside the desert, I watched Mohsen deflate the tires on his Land Cruiser to about 15psi. He tells me this allows the vehicle to properly handle driving in the sand. Boy was he right. We started off with Colin sitting up front and Laura, Stan and I in the back. Before we begin climbing our first big sand dune, Mohsen carefully selects some sort of arabic-techno music to get us going. He turns it up loud and off we go! To say that my stomach was doing flip flops and my heart was 'in my throat', would be putting it mildly. Going up and down those first dunes caused me to let out some serious screams and grapple onto Laura in a sort of frantic bear hug. Craziness! 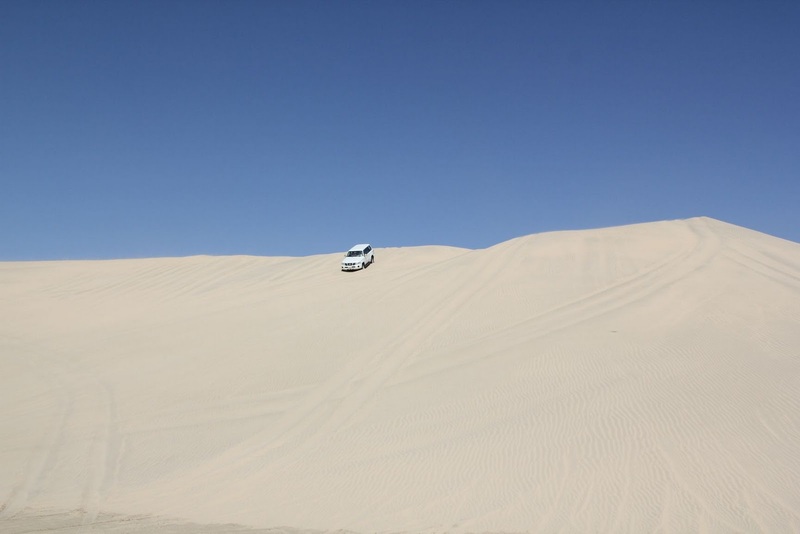 We zipped up and down dunes, went backwards down shockingly steep hills, drove alarmingly close to sandy edges, and went at speeds that I was stunned we could reach on sand. Oddly enough, I actually felt safe the entire time. Was I scared? Yes, out of my mind scared... but, not like so-scared-I-might-pee-my-pants kind of fear... more like an electric I-don't-want-to-know-what-is-coming-next-but-I-can't-wait-to-find-out kind of feeling. I can't think of a more perfect description, but to call it hair raising. It really was. I know for a fact that the boys were pretty rattled as well. I could tell by their occasional cries of "OhhHHH NooO" or "Holy Sh*****tttt". We all laughed really hard for about two hours straight. ﻿Highlights of our day included getting to put our feet in the Khor al Adaid (also known as the "Inland Sea"), while looking over at the hills of Saudi Arabia. The sun was shining brightly, the temperature was perfect, and the desert couldn't have looked more beautiful. I had a few of those moments where you look around and think to yourself, yep, this is pretty damn cool. All in all, a really good experience. 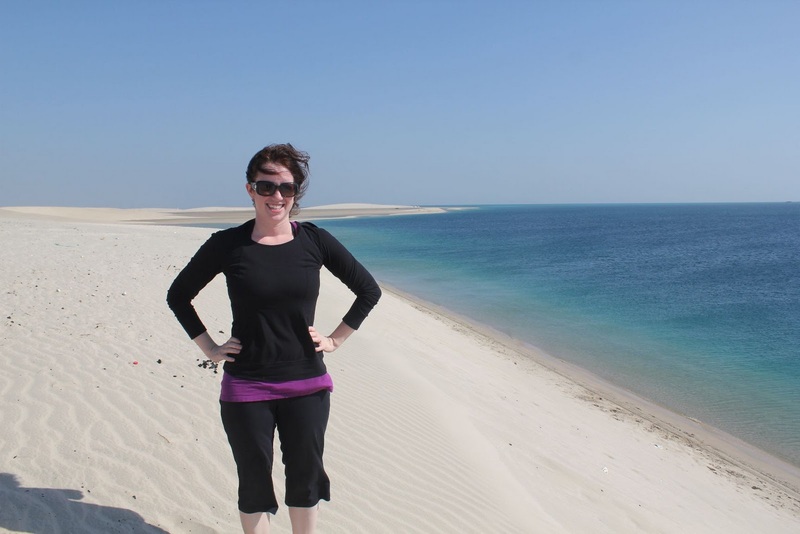 I have now crossed Dune Bashing in the Arabian Desert off of my bucket list (and feel no need to do it twice). After we got home, I had a solid two hour nap to recharge the batteries (all that excitement wears a gal out), and the next day, my voice sounded like I had swallowed an ash tray. Apparently I screamed and hollered more than I realized. Haha! Yes, it was quite a day. And we've done it three more times since then. Think we've gotten our fill yet?